All of our framed and matted prints are produced here at the Mountain House Press on Dard Hunter’s original hand presses. 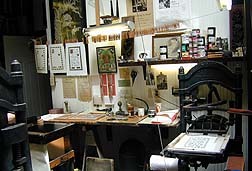 The print shop looks pretty much as it did when he was using it during the 20’s and 30’s to produce many of his famous books on papermaking. The walls are covered with memorabilia and artifacts from his many travels and collections. These were also the presses his son, Dard Jr., used to print his monumental work titled The Life Work of Dard Hunter, a project that took 15 years to complete. The old iron hand presses may seem archaic to some, but they are the perfect tools for printing large images on the rough surface of handmade paper. 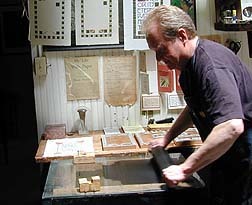 Because handmade paper sheets have no straight cut edges, it is impossible to line up, or “register” the sheets in other types of presses for multiple color impressions. The hand press, however, hangs the paper on two tiny pins, producing pinholes that may be used to re-position the paper many times in the exact same location. Also, the tremendous pressure exerted by these presses is ideal for making a clean impression on the irregular surface of handmade paper. It’s slow and exacting work, but the look and feel of the finished product reflects the dedication and care of the turn of the century craftsman. A metal printing plate or dye is required for each color of the final print. Each plate has, in raised relief, the image to be printed in that color. The plates must be carefully positioned in the press so that the images for each color will meet the paper in exactly the right spot and overlap correctly when printed. One color is run first, usually the lightest one. We produce our prints in small limited editions, usually of only 50 to 100 final prints. We work with slightly dampened paper which softens the surface and makes printing easier, but also makes the handling of the paper more difficult. After printing the first color, each sheet must be carefully covered and prevented from drying out before the other colors are applied. These three sheets show the three colors which will combine to form the final print. When the plate is positioned and the paper is ready, we roll out the ink on the ink table and prepare to hand-ink the plate. For each print made, the paper must be positioned and the plate individually inked. And we’re only on the first color! This operation will be repeated for each sheet to be printed. Working with a press like this, 100 to 150 impressions is a full day’s work. 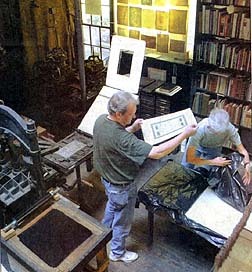 With a hand press, the work to be printed is locked into the flat bed of the press. 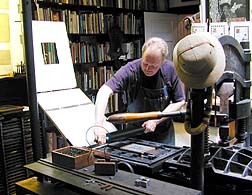 The ink roller is then carefully rolled over the surface of the plate to apply the ink evenly. The paper is held against the tympan, shown opened on the left. When everything is ready, the tympan is folded down and over the bed of the press, and the whole thing, plate, paper and all, is cranked under the heavy iron platten of the press. 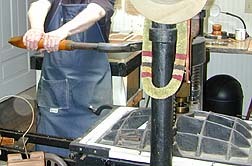 A pull of the handle brings the platten down to press the paper against the inked plate and an impression is made. The press bed is then cranked back out, the tympan opened, and the print carefully removed from the pins, ready for the next color. It usually takes one full day to produce a small run of the first color, so a multi-colored print could take three or more days to complete.